The Jet Rescue SLSA Sled was produced in conjunction with Surf Life Saving Queensland, Lifeguards and Rescue Water Craft (RWC) Specialty Teams. With the use of their craft being different to that of the average Lifeguard or jetski operator, Surf Life Saving Queensland saw a need to modify the original Jet Rescue Sled to produce the Jet Rescue SLSA Sled. Made from unique closed cell foams, and incorporating a soft deck pad and hard skin bottom, the Jet Rescue SLSA Sled has the capabilities of being a strong and extremely safe sled. All our foam is heat laminated to avoid delaminating and is fully treated for the harsh beach conditions it will endure. Now fitted with our New Sled Nose Cone the Jet Rescue 'Newks' SLSA Sled becomes a hard working, valuable piece of rescue equipment. 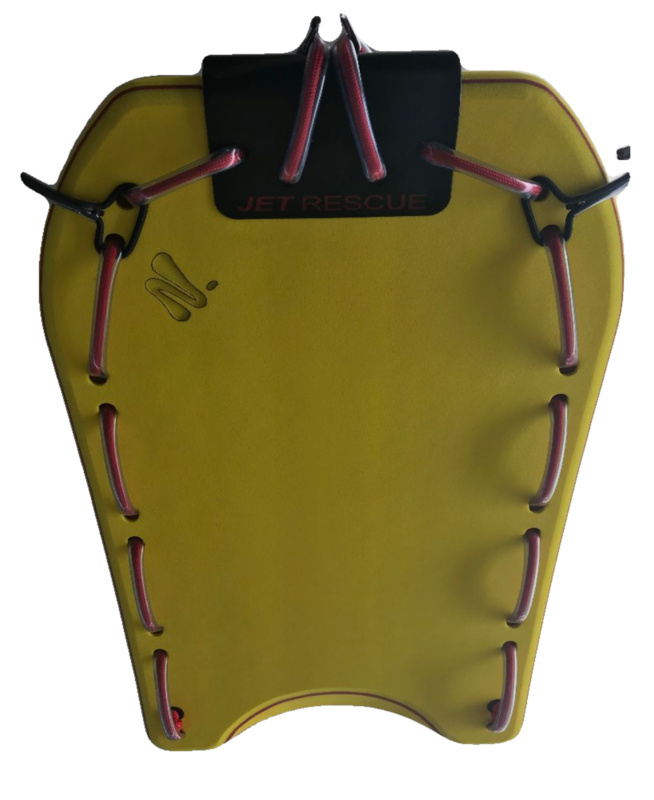 The Jet Rescue SLSA Sled has 10 handles, with 8 of these being along the sides of the sled and 2 across the nose section. Therefore the Jet Rescue 'Newks' SLSA Sled exceeds requirements set by Australian and Hawaiian Rescue Sled Standards. The Jet Rescue SLSA Sled will fit all makes and models of RWC. The Jet Rescue SLSA Sled is fully endorsed by SLSA. They are recommended by the Australian Professional Ocean Lifeguard Association, Surfing Australia, SEA-DOO, YAMAHA, POLARIS and KAWASAKI watercraft dealer’s Australia wide. The Jet Rescue SLSA Sled is currently fully endorsed by Surf Life Saving Australia and all the state bodies as well as being recommended by the Australian Professional Ocean Lifeguard Association, all brands of Watercraft manufacturers, and Lifeguarding and Lifesaving organizations around the world. We currently supply equipment to the above Organizations as well as Marine Rescue NSW, Victorian Police, Queensland Police, New South Wales Police, Hawaiian Water Patrollers, Volunteer Marine Rescue Services, Surfing Australia, Royal National Lifeboat Association, Japan Professional Rescue Organization, Japan Lifesaving Association, Surf Life Saving New Zealand and various other surfing and surf rescue users around the world. While other manufacturers will push their craft through expensive advertising campaigns, we place the lion's share back into the development of quality lifesaving products therefore you will not see us advertising in those expensive magazines but you will however notice the quality in the products we supply. As all of our staff at Jet Rescue are involved in Public Safety and Lifesaving activities, we have personally experienced the advantages of the equipment we manufacture and therefore aim to keep our prices as low as possible to maximize the availability of our cost effective and robust public safety solutions. 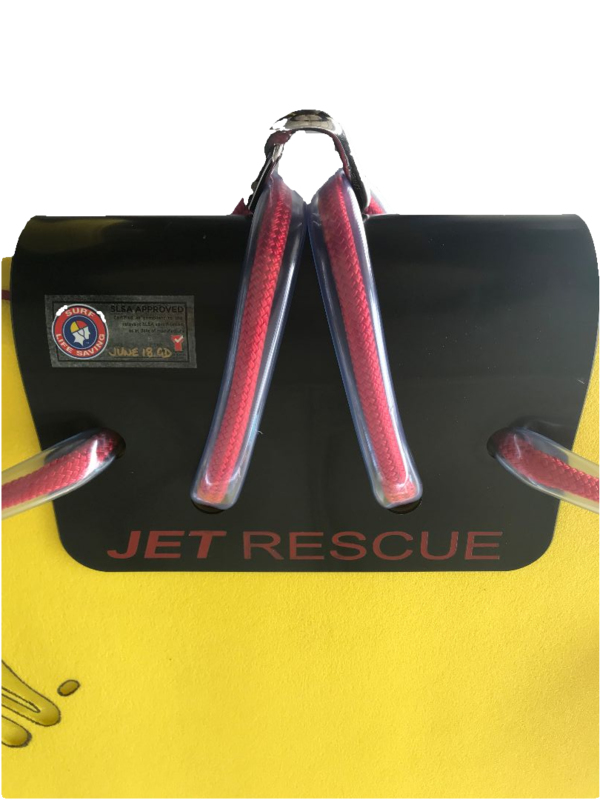 The Jet Rescue SLSA Sled is made from 100% polyethylene foams.Therefore we do not cross link products that are not compatible with each other.This in turn eliminates delamination. Our sleds come with a comfortable soft deck pad and a hardened slick skin on the bottom. This provides both comfort, strength and stability on the craft. All sleds are provided with a heavy duty nose cone to avoid wear and tear on both the sled and the craft. Our handles are made from rot resistant 12 ply rope that is encased in 3mm thick plastic to provide long life and easy grab points for the users. The handles pass right through the sled eliminating sharp edges on the ends of the grab handles from cut plastic hose and bolts or fittings. All Jet Rescue Sleds will fit all makes and models of PWC. All Jet Rescue Sleds are 100% Australian made and owned. We will send you and email with any additional or reduction in freight charges after your purchase is complete. Usually $14 for packaging and $79 for freight will get it delivered safely to most Australian destinations. Alternatively email us for a quote before you purchase and we can invoice you for the sled.